The Forth and Clyde canal was the first ever canal to be built in Scotland, and much more recently, has been the largest ever canal restoration project in the country. The canal restoration and construction of the Falkirk Wheel was one of Scotland’s largest Millennium projects, reopening the canal in 2001 40 years after its closure. Canals in the UK have a long history dating back to the Romans, who built several canals here including the Fossdyke, which is still navigable today. A long period elapsed after the Romans left Britain when no canals were built. Instead improvements to rivers were made with the aim of harnessing waterpower, or for fishing, rather than for navigation purposes. It was in the reign of Elizabeth I that the next canal was built, at Exeter. This was also the first use in Britain of pound locks – the type of lock in common use today – all the navigable rivers at that time used flash locks. After this many schemes were introduced for the improvement of river navigations, often provoking strong opposition from water mill and fish weir owners. In 1660 there were 685 miles of river navigation, by 1724 another 475 miles had been added by improvements to many rivers including the Aire & Calder, Douglas, Idle, Irwell, Kennet and Weaver. When work began on the Forth & Clyde Canal in 1768, the plan was for the waterway to progress steadily westwards from the Forth via the River Carron to Stockingfield (Maryhill), in Glasgow. Nine years later work stopped due to lack of funds and eight years went by before money forfeited from the Jacobite Estates became available, allowing the canal to continue its journey to the River Clyde. The weather, strong currents and island-strewn western coastline of Scotland meant sailing around it was risky as well as time-consuming in the 18th century. The idea of building a canal across the narrowest part of the Scottish lowlands to connect the Firth of Clyde and Forth gathered momentum and the Forth and Clyde canal was born – a 35 mile canal, with 39 locks, from Bowling on the northern bank of the Clyde to the southern side of the Forth near Grangemouth. The engineer, John Smeaton, carried out most of the design drawing on advice from, among others, the geologist, James Hutton. The canal was constructed between 1768 and 1790 bringing new opportunities for trade and manufacture to the communities along its banks. Small ocean-going vessels could carry goods along it, and parts of the canal branched off into Glasgow and Edinburgh. Shipbuilding yards were established at Bowling and Kirkintilloch, mostly building the small steamboats, known as Clyde puffers. The puffers had to be less than 20m long to fit in the canal locks, and plied routes along the canals and rivers and out to the islands. They were immortalised in Neil Munro’s Para Handy stories about the Clyde Puffer The Vital Spark. The pace of change in the 19th century was so great that by the time the major canals were all finished, their role as a transport route was already being overtaken by the railways. Management of the Canal was taken over by the Caledonian Railway in 1853. Each canal in the country is an engineering feat and tells its own story about the surrounding area. J. Hay & Sons Ltd of Kirkintilloch were both boat builders and operators on the Forth and Clyde Canal. It wasn’t too long before their operations extended out onto the Clyde and the west coast and Hebridean Islands. Starting with a fleet of horse-drawn scows transporting coal, iron, timber and grain on the canal, in around 1857 Hay fitted some of his scows with simple non-condensing steam engines driving a single screw, and also in 1857 took delivery of the first ever steam screw lighter to be built as such from scratch. This vessel, named “Glasgow”, was built by David Swan at his Kelvin Dock yard on the canal. In 1867 William’s two sons, James and John, took over the floundering boatbuilding business of Crawfords in Kirkintilloch and put it to work maintaining the family’s fleet of canal boats. In 1879 they went into the business of operating coastal steamers on their own account with James running that side of the business and John continuing to manage the yard. They soon turned to building their own vessels and the “Helena” was launched that same year. In the ensuing decade the yard launched eleven vessels, ten for themselves and one, “Aniline” for a Falkirk owner. New-builds were launched broadside into the canal as shown in the postcard from the early 1900s reproduced below. The letters “ITO” are visible and so it is possibly the 1905 “Briton”. The location of the launch is readily identifiable today from the red sandstone building in the background which still stands at the corner of Southbank Road and Townhead. In 1888 the firm of J Hay & Sons Ltd was formally constituted by John Hay to run the coasting business. Shortly afterwards he took over the shipbuilding side of the business and renamed it J & J Hay Ltd. In the period from then until the start of WW1, the company built 14 vessels for its own fleet. In 1917 the yard was awarded an Admiralty contract for some barges with tanks for the carriage of oil from Grangemouth on the Forth to Bowling on the Clyde. Just as the work was completed the admiralty decided to lay a pipeline instead. In 1921 the two companies were merged into J. Hay & Sons Ltd and in the inter-war years the company became the principal operator on the canal. During WW2, only three vessels were built at Kirkintilloch: VIC18, the Kaffir and the Boer. Their final build was the 1946 Chindit, for their own fleet. Hay’s shipyard at Kirkintilloch was demolished in 1954 although the slipway remained in use for ship repairs until 1961. During this time Hay required a reputation for rebuilds of salvaged lighters. As a vessel-operating company only by now, J & J Hay merged with G&G Hamilton in 1963 to form Hay-Hamilton Ltd, who in turn amalgamated with Ross & Marshall in 1969 to form Glenlight Shipping. For over 200 years the Forth and Clyde Canal was in operation. It was nationalised in 1948, then closed down in 1963. It reopened in 2001 after massive regeneration. 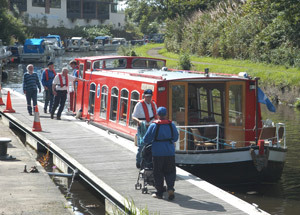 Now it is the focus of leisure activities; such as sailing through the canal for a sea-to-sea transit between the River Clyde and the River Forth. It also plays host to canoeing and kayaking enthusiasts who can paddle boats from coast-to-coast. Because of the new facilities on the canal and improved banks, as well as the ‘flat water’ it is a popular spot for paddle sports. Canal fishing is also popular, with species including roach, bream, rudd, gudgeon, carp, eels, tench, perch, pike, and trout. British Waterways Scotland, who run Scotland’s canals, hold an estimated 7,766 megalitres of water in canals and 18,304 megalitres of water in reservoirs. They are rolling out a programme designed at encouraging people to take boating holidays on the canals, and, since living in a houseboat has become a sought-after lifestyle, BW have selected locations across Scotland where people will be able to reside in boats on the canals. Cycling the Forth & Clyde Canal towpath has never been easier or safer, thirty-five miles of towpath through beautiful countryside have been restored with the cyclist in mind. Sustrans Route 754 follows the canal towpath from Bowling to Edinburgh, so you can cycle across Scotland coast-to-coast. The towpath between Dalmuir and Bowling forms part of the scenic Glasgow to Loch Lomond cycleway. There are many walks taking in the countryside along different sections of the canal path, however if you want a long-distance walking challenge, there’s only one path to walk from one side of Scotland to another. It takes two days with a stop-over point in Kilsyth to spend the night and stock up on supplies. If you want to venture further afield, the canal path also forms the middle section of the 134 mile John Muir Way – one of Scotland’s Great Trails. This coast-to-coast walking and cycling route runs from Helensburgh to Dunbar, providing opportunities to explore the wealth of nature and history across the heartland of Central Scotland. It can be explored in sections, or as a ten day expedition. Along the canal there are four places of particular wildlife interest – Dullatur Marsh and Possil Loch are designated as Sites of Special Scientific Interest (SSSIs) and each end of the canal is a designated Special Protection Area (SPA) for estuarine birds. Wildlife on the Forth & Clyde includes many types of bird, plant, fish, and mammals. Otters frequent the canal, as do pipistrelle and Daubenton’s bats. Nearby hedgerows and woodland provide cover, nesting sites and food for hedgehogs, grey partridge, chaffinch, water voles and wood mice. Watch out for the extremely rare Bennett’s pondweed – the only location in the world where it is known to occur. Birds you’ll see along the canal include mute swan, mallard, coot, little grebe and tufted duck. Children can benefit a lot from outdoor learning experiences, and the canal offers a wealth of such learning opportunities for primary schools, uniformed groups and families. There are a wide range of tailored, canal specific resources in addition to broader educational aids for learning about the waterways, which help make the canal a perfect topic choice for a class or school project. Resources are linked to the Curriculum for Excellence learning outcomes and achievements, making it easy to link particular aspects of the canals into broader topics. There are also plenty of volunteering opportunities in the area for both adults and young people. 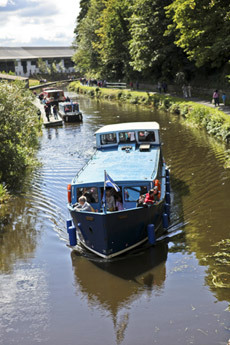 The Kirkintilloch Canal Festival celebrates the heritage of Kirkintilloch, including its status as Canal Capital of Scotland. Around 15,000 visitors attend what has been to date a fantastic weekend of events in Kirkintilloch. 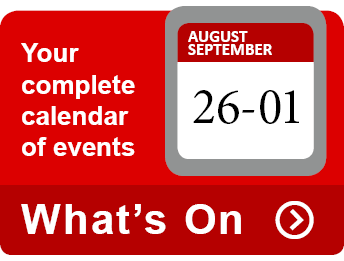 This year the festival will be a week-long, with events daily, and culminating in a terrific weekend with a jam-packed activities day on the Saturday and ever-popular Gala Day on the Sunday. Activities will be centred around the marina.